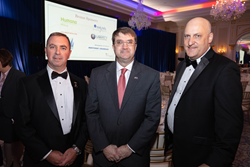 Secretary of the U.S. Department of Veterans Affairs, Robert Wilkie, joined Paralyzed Veterans of America last night in honoring three companies for their leadership and efforts to expand the rights of the disabled. Over 400 guests attended the 13th annual event, which also raises important funds to help Paralyzed Veterans of America keep their programs and services available, free of charge, to veterans and their families. “Members of Paralyzed Veterans of America—your advocacy for veterans, your adaptive sports and employment assistance programs, your educational opportunities and scholarships, your battle to ensure veterans with spinal cord injuries and disease are cared for—all of that empowers brave men and women to regain the freedom and independence they fought for,” said Secretary Wilkie during the program. Three companies received special recognition. The National Mobility Equipment Dealers Association (NMEDA) from Tampa, Florida received The Access: ABLE Award. The award recognizes NMEDA’s commitment to providing disability and mobility solutions that remove barriers. The Employ: ABLE Award was presented to USAA based in San Antonio, Texas for leadership in veteran employment. Finally, UPS, headquartered in Atlanta, Georgia, received The Sustain: ABLE Award. UPS has provided corporate support of the Paralyzed Veterans of America mission, programs and services for many years. Significant contributions from corporate America made the evening possible. Leidos, a FORTUNE® 500 science and technology leader, served as the presenting sponsor. Penske Automotive Group and Penske Truck Leasing provided support at the platinum level. Additional corporate support was provided by over 40 companies and foundations. Learn more about the Mission: ABLE Awards at http://bit.ly/PVAMissionABLE.